A cool, soothing and stimulating shampoo and body wash formulated with certified organic plant, vegetable, flower and tree extracts. Helps improve blood circulation, relieves itching, and replenishes essential moisturizing nutrients throughout the scalp. Restores luster, softness, flexibility and shine. Detangles instantly. I love this product. I love that it is body wash and shampoo. One less product to buy. Smells amazing too! I've been trying to go "natural" with my personal care and really enjoy this brand. I have fine, straight hair and really like this shampo. You may need more moisture though - i use moroccan oil on my hair and vitamin E on my skin after use. It worked great for my hair. Lovely packaging. I'm so glad well carries this line! 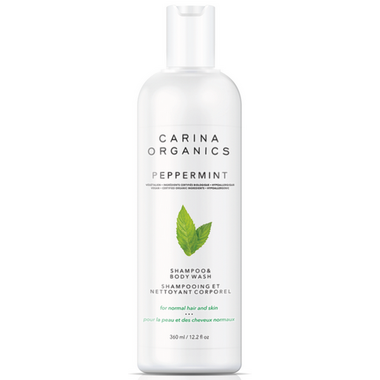 I use to buy this shampoo from a store in the town where I lived, but since I moved I haven't seen the carina line of products anywhere. I love their products. This shampoo is great! It feels very refreshing, nice natural mint smell without any of the synthetic fragrances. I am very sensitive to synthetic fragrances and many shampoo products, which is why I love this line. Sometimes it takes a bit extra shampoo or effort to get it to lather, but it's worth it! Refreshing and invigorating mint smell! Leaves your hair feeling clean and doesn't weigh it down. Nice smell, rinses out well, doesn't clog hair up. Takes a good amount to get a solid lather going, however that's standard with low to no sulfates. I like the conditioner best. Great scent, subtle. Cleans well, and rinses out clean. Good for normal to oily hair, would not recommend for dry hair. The scent is subtle but very nice. Cleans hair well although I have a lot of hair so take 2-3 applications for a thorough clean. Leave hair soft and manageable.